The CFA breed standard accepts the American Wirehair cat in all colors and patterns, except those that show evidence of hybridization which would result in chocolate, lavender, the colorpoint pattern or those combined with white. American Wirehairs are almost carefree cats. When needed, wash them gently with a mild cat shampoo, rinse well, lightly towel dry and let them do the rest. Never use dryers or combs on the wirehair's unique coat. During shedding season, it's ok to use a fine hair pick to keep the dead hair from clumping, but no more than this minimal grooming is required, except of course, for regular nail clipping. American Wirehairs are very Loving and good with all kinds of people. They like to be in the middle of everything. Individuals love to be lavished with solo attention, so if you have mulitple wirehairs, in addition to group play, make sure each one gets some much needed one-on-one time every day. These cats love playing with anything and everything. Toys of all kinds fascinate them, from paper bags to fancy electronic toys and even your car keys! These jolly little clowns will work hard to entertain and get your attention. If the anticipated adoration doesn't happen instantly, they usually will persist until you notice. They learn early to give head bonks and kisses to get attention. Wirehairs are very sensitive to the moods of their humans and tend to stay close to offer comfort when their humans are upset or ill. The American Wirehair cat is a medium sized, well-muscled cat. The coat should feel harsh and springy. Individual hairs are crimped, hooked or bent, including ear hair and whiskers. According to the CFA, Of the 100-point scale used to describe the ideal cat in the standard, 45 points are assigned to coat - more than any other breed. These cats have very prominent cheekbones and a piercing gaze when they want something from you. The American Wirehair cat has one of the most unusual coats in the feline world. Due to the bent or hooked nature of each hair, it appears to have a somewhat wild looking, springy coat, and what's more, their whiskers have the same texture. This breed began as a spontaneous mutation in a litter of upstate New York farm cats in 1966. 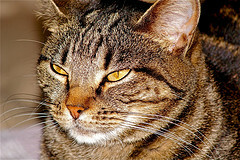 Through selective breeding and outcrossing to American Shorthair cats, the breed was refined to what we see today. This breed was first accepted for CFA registration in 1967 and for championship competition in 1978. It's been an unusual trek from barn to show arenas, but through it all, these rough-coated kitties have retained their home-spun charm and loveability. Generally a quiet and loving cat, the American Wirehair is happiest in an active household with lots of one on one playtime.